The sky smelled like spring storming, but a cloud of bone-dry dust marked Ramlin’s progress down the road. It had seeped into his clothes some miles since, fading them; and his rented horse punctuated every fifth step with a discontented huff. Leading the beast along by the reins so he could feel the ground beneath his boots for once, the traveler didn’t mind the dust. The evening was quiet and wild–dark-cloud skies and a golden sunset–with yellow light glowing gem-like through the buds of the willow trees. In spite of the journey that sorely needed finishing, Ramlin walked at an unambitious pace, determined to enjoy the fading vignette of perfect beauty. The horse huffed again, halted, and refused to walk another step. Used to the beast’s protests, Ramlin gave the reins a gentle, almost indecisive, pull. The horse snorted again, tossing her head and stamping. Head up as high as it could go, she stared into the mass of glowing willows with eyes wide and ears sharp as pinpricks. “Spooking at rabbits now?” Ramlin asked. By way of reply, she looked at him with something that might have been uncertainty–or scorn. It was hard to tell with horses. She whuffled, less than convinced. Ramlin turned back to plod on–and found himself looking down the barrel of a pistol. “Halt, and state your business!” the man behind the pistol said roughly, the somewhat flamboyant mask over his mouth rumpling with the words. Ramlin frowned–first at the mask, then at the man. The brigand looked taken aback, but only for a moment. He scowled, cocking back the hammer on the flintlock–in order to be extra threatening, Ramlin guessed. With an indignant huff, the man lowered the pistol. The brigand threw up his hands in a silent plea to the gods, then wandered to the edge of the road and sat down to wait as Ramlin got his words in order. After a minute or so, Ramlin punched the air. The man’s shoulders slumped, and he looked at Ramlin with ironically half-lidded eyes. “It’s a bookful of outdated drabble written by a drunken university professor who never made a joke in his life,” the brigand returned, fishing something out of his coat pocket. He drew out a book–small and worn, but with a perfectly readable title. Ramlin scowled at it. The horse, a creature generally uninterested in both jokes and existentialism, had slowly wandered off. As the debate raged on, she decided to pass the time munching on willow branches–something which she was very interested in. But whether or not she was sensible to philosophical debates, the beast did have a sense of danger. She was not entirely certain what this sense was made up of–the faint crackle of leather soles over the dry ground, a nip of gunmetal scent drifting in her nostrils, the sudden quietness of birds. But as it flickered to life in the back of her mind, she ceased her munching, pricked up her ears, and snorted to warn her master of the approaching doom. Ramlin, however, was now caught up in arguing whether flippancy was a true form of humor or simply–as the brigand put it– ‘the ghost of a dead sense, moaning its end.’ As a result, he did not notice the danger until, looming behind him, it settled the cold barrel of a pistol at the base of his neck. The brigand, equally blinded by the fervency of his own statements, noticed the danger the same time Ramlin did; and by then it was too late. There were three of them. Dressed in faded cloth and leather spattered with the rust of dried blood, these brigands made the first seem like a character from a stage play–and they had surrounded Ramlin and this opponent both. The group was made up of a hulking axe man, a dark-haired, cold-eyed girl in a tricorner hat, and a lanky fellow who refused to move his pistol from the back of Ramlin’s head. This last spoke first, in a low and gravel-tempered tone that seemed the original to the first brigand’s parody. Nargle shut his jaw tight over whatever he had been intending to say next. Ramlin, in no better position, almost pitied the thief’s predicament–even if he was a detestable believer in P.J. Dorbel’s lies. “So we get to rob the both of you!” the axe man said, as though he was announcing that cake and pies were available for everyone after the show. Brinker gave him a humorless look. Torsa grinned and hefted his weapon, taking a step towards the suddenly dwarfed Nargle. The smaller brigand cried out in protest–as did Ramlin, once he realized what was happening–but the cry was cut short as Torsa brought the base of the axe down on Nargle’s unprotected head. “You’re lucky to be alive,” someone remarked, before Nargle was fully certain of the fact that he was alive. He blinked, forcing himself to focus on the waking world. The willow branches above his head whispered with the wind, slithering out of the night’s blackness like great yellow-orange fingers. They were unsettling. He tried to get up. Nargle’s head spun, and he gagged before lying back down again. The facts were attempting to reconcile themselves to Nargle’s mind. He rubbed a hand absentmindedly over his face, trying to clear the persistent ache, and came to the realization that his mask was gone. Panic spiked in his chest, gaze snapping to the owner of the voice, who was staring curiously at him across a small campfire. Nargle was silent, unable to view the man who’d seen his face and saved his life with anything but trepidation. Nargle let out a tense breath. He didn’t like the idea of hanging any more than the next man. Nargle nodded and immediately regretted it, closing his eyes with a groan. “Why not?” Ramlin looked genuinely curious. Nargle laughed. Then, realizing laughter hurt, he stopped. “Well, it’s a perfectly fine name–but you just so happen to share it with someone a little less than fine,” he explained. “Some jumped-up government official who’s been threatening to come out of his ivory tower to sort out the provinces–not that he ever will, but the threat’s enough to get him disliked around here.” He grinned, happy to be the expert on local politics for once. Usually it was a subject he would rather avoid. The odd expression on Ramlin’s face hadn’t changed. He stared at Nargle for an uncomfortable moment, then looked at the ground with a sort of half-smile. By the time he looked up again, Nargle had almost guessed the truth. He gave the shocked thief a self-deprecating grin, and Nargle squeezed his eyes shut against the sudden worsening of his headache. Brinker did not particularly mind robbing fellow thieves, or even leaving them for dead on the roadside. He didn’t particularly mind robbing anyone. It was, perhaps, this uncommon lack of conscience that deprived him of seeing the irony in his next words. The three brigands hadn’t bothered to flee all the way back to their hideout, instead rifling through Ramlin’s possessions a mere mile or so down the road. The cover of night, broken only by a lantern or two, seemed sufficient to hide them on the deserted road. “Oh.” Mollified, Torsa went back to his pack. “Of course, that would be far easier to do if we didn’t waste our time bullying poor saps like Nargle off their territory,” Melli said in a faint sing-song, focusing with abnormal determination on her fingernails. Brinker looked at her narrowly. “I’m sorry, but are you–” he began, but was interrupted by Torsa throwing something small and hard at his head. Brinker scowled at the disc, which had landed in his lap. Soon, the scowl disappeared and he picked the thing up. It was simple enough–a circle of wood, carved in intricate patterns and outfitted to hang medallion-like on a chain. Thoughtfully rubbing a thumb over the engraved letters at the thing’s edge, he met his companion’s curious gazes. The next morning was beautiful, full of sunshine and birdsong. Nargle resented it. As much as Ramlin insisted that his head hadn’t suffered any permanent damage, it felt as though it had been permanently bruised, and everything from light to noise to the very steps he took seemed to aggravate it. Ramlin was trying to encourage him. Nargle halted his stumbling progress to squint at his companion. Ramlin raised his eyebrows. He’d never heard anyone say something so sensible and stupid all at once. He was used to cries for justice, pleas for justice, wailing and weeping to escape justice, but never simple apathy over it. He supposed that he never would hear of it, in his line of work; those sensible, careless people were unlikely to be seen in a justice hall. They were probably all off somewhere else, eating sandwiches–and Ramlin almost wondered if those invisible sandwich-eating hordes were not better off than the rest of humanity. On the other hand, he had just been robbed, Nargle basted and left for dead. As a response, apathy was comfortable but unwise–the next traveler that Brinker and his brigands left for dead might really end up that way, and that was something that Ramlin, for one, did not care to have perching on his conscience. He grabbed a handful of Nargle’s coat, pulling him in an unwilling jumble of limbs down the road. “Magistrate Ramlin,” a steward announced, and the entire court rose as the Magistrate, with all his robes, tried to make his way from the entrance of the town’s tiny justice hall all the way into its uncomfortable seat of justice without tripping. He failed. As the magistrate flopped into his chair with a scowl, the steward cleared his throat and announced the first case. “These are the two thieves that attacked you, and almost made off with your identity as well,” he said in the brief and somewhat condescending aside that he often used to announce cases. The magistrate scowled, first at the defendants, then at the steward, with equal dislike. “You can’t be serious.” This from the first of the two thieves, a dignified-looking man, if a little travel-worn. “Believe me, he is,” the second of the pair, a shorter, flaxen-colored fellow with a bandage wrapped around his head, replied. The magistrate flipped his wooden seal of office over his fingers pointedly, then looked down at the two ‘thieves,’ a sharp grin flashing over his face. In spite of tangling robes and condescending stewards, Brinker was determined to enjoy his newfound power to its utmost. He aimed the greater part of his smile towards the real Ramlin, who stared back in useless indignation. The justice hall only employed one guard, the same guard they had employed for the past sixty years. He shuffled steadily towards the defendants over the space of a minute, reached them, and then began to lead them away with no great increase of speed, bringing Brinker’s resounding command to a bit of an anticlimax. “Shut up,” Ramlin hissed back. Ramlin had seen prisons before. He had inspected prisons, discussed prisons, and sent many people to prison. He’d always thought that if there was one thing he understood, it was prisons. As it turned out, they looked a great deal different if you were actually stuck in one. Nargle had sprawled in relative comfort on the floor, leaning his head against the wall and watching Ramlin through sleepily half-lidded eyes. Ramlin, who had only partly realized that he was pacing at all, stopped. “How can you possibly be sitting still?” he burst out. Nargle shrugged, shutting his eyes. The door opened almost as soon as he’d asked. Brinker burst into the room, fluttering his robes like the wings of giant raven, with the girl and the axe-man in reluctant attendance. Unmasked, they all looked a great deal different–almost respectable, if Ramlin hadn’t known better. He scowled at them. Brinker turned from his task of shutting the door with an odd expression. “I can assure you, we’re not,” Ramlin put in, but Brinker wasn’t done. “Are you sure about–” Nargle began. “The court scribe threw an inkpot at my head!” Brinker hissed, no doubt intending to shock everyone. Perhaps Nargle was shocked; but Ramlin only nodded. “We… have to help you… escape?” Nargle repeated, looking around the walls of their cell in pointed confusion; but Brinker, as usual, was unaware of the irony. Nargle turned to the other two thieves, who were looking as grim as their superior. “They took away my axe,” Torsa added, as though this was an offense against dignity to top all others. Ramlin frowned, conflicted. He didn’t doubt that Brinker was telling the truth. The life of a brigand was a far freer and more interesting one than the life of a magistrate. If Ramlin was telling the truth as well, it was probably a healthier one. But if magisterial duties were truly so confining, what better prison for a heinous thief? Finally, he made his decision. Brinker’s eager tone was not very convincing. Ramlin squinted at him, but there was no going back now. The brigands leaned forward in a small, hopeful huddle as Ramlin explained his plan. The words lingered in the dark air for a moment. Then Nargle sighed. Shuffling was heard along the hall, and Torsa attempting a whisper. “Do you really think we can trust–” his booming baritone began. “SHHH!” two sibilant voices rejoined, and the attempted whisper fell dead. A key turned in the lock, and the door to their cell slithered open. Ramlin led the way down the hall. The prison was somewhat less than well-guarded. It was a small provincial jail, after all, meant for drunks and vandals and second-rate thieves. It was relatively easy to get out the front door, and in the nighttime quiet there was no trouble walking across the open village square. When they reached the gate, Ramlin halted. Brinker looked into the whispering, forested blackness and thought he smelled freedom. He turned to Ramlin, gratitude watering his eyes. Someone had noticed the prisoner’s absence, and shouting had begun in the town. A flare of torches flickered orange against the city gate. Brinker’s face was white. Brinker didn’t mind him, looking instead at Ramlin–the only one present who really understood his terror. “Magistrate! 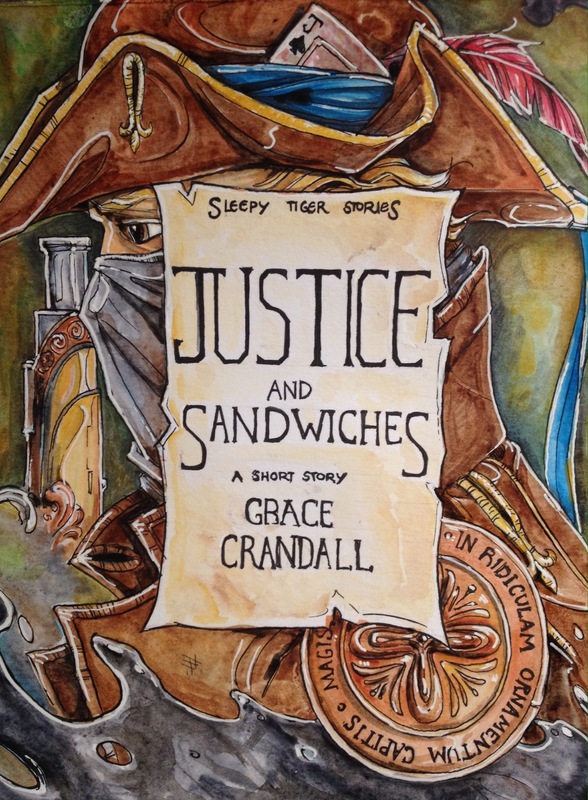 The magistrate has disappeared!” cried a shrieking voice–the steward’s–and Brinker and Ramlin both flinched at it. “Find him! Find him!” echoed the secretaries, as red torchlight and a dark-lit swarm of bodies began to fill the square, milling about in search of criminals and Justice alike. “I’m sorry,” Ramlin said, sincerely. But sincere or not, sorry wasn’t about to stop him from running. “There he is! There he is!” the hellish voices cried as the four thieves fled into the forest. Nargle looked back once. He saw the scribes, the secretaries, and the steward surrounding Brinker with screeches and torchlight. Brinker himself stood statue-still, the seal held tight in his grip like a proclamation of doom–then the lawful horde swallowed him up in its happy embrace, and he was gone. They all looked to Ramlin; though it took him a moment to notice. He was their leader now, he realized; as Brinker once had been. He wasn’t the only one to have stolen a life. Perhaps Brinker would make a better magistrate than Ramlin had been; and perhaps, just perhaps, Ramlin would make a better brigand. Nothing had changed, not really; right and wrong were in their proper places, things quite different than lawful and unlawful. Nargle looked at him curiously. This tale was written in honor of my Dad’s retirement from a job as soul-sucking and unpleasant as a Magistrates’–and subsequent move to something slightly more legal than, though just as adventurous, as brigandry. Love you, Dad! This is great! The banter is wonderful.